Those days, mired as they are in the depths of time, are but echoes heard now by few, remembered by only the oldest and most learned of the scholars. Grausumhart's cities have all but vanished from the face of Aihrde. Only ruins remain, and even these have become as much a part of those ancient mountains as the stone and are faded now, as is much of the Dwarven Glory. 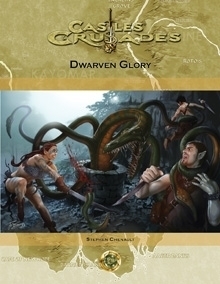 Dwarven Glory is a series of fast play adventure stories. Each of the adventures is playable as a one shot scenario. Dwarven Glory takes place in the world of Aihrde in the southern Rhodope Mountains, the Smoking Giants, specifically within the edge of the Darkenfold forest. These mountains lie on the far western edges of the world map as supplied by Troll Lord Games. Usage of Dwarven Glory in other settings or transplanted anywhere in Aihrde is as easy as finding an old mountain chain on your map. There are three adventures included within: The Looking Stones, Wyrm Well and The Winding Stair. The Looking Stone is an adventure for a smattering of characters of levels 4-6. The party is confronted by ancient Dwarven guardians and the dead such as they have never encountered before. Wyrm Well is a short dungeon adventure designed for 3-5 2nd level characters. The Wyrm Well is a long buried dwarven dungeon haunted by the creatures of yesterday. Explore the deeps of the Wyrm Well and learn why even Dwarves may come to fear the dark. The Winding Stair is a short dungeon adventure designed for 3-5 3rd or 4th level characters. Bael the Dwarf Lord carried into those mountains a great axe, an heirloom of sorts, given to him long ago during one of his many adventures, by one of the Val-Eahrakun. Bael is long gone and his memory has faded from the earth. But the refuge he built for himself and his precious axe remain, now forgotten ruins in the tall mountains. There upon a lonely a path where the wind battles with time for the destruction of the world lies the Winding Stair.